Frontiers Records is excited to announce the signing for a multi album deal of the mighty VISION DIVINE, Italy’s Melodic Metal Finest. The new cooperation will bring the first fruits with the release of the band’s brand new studio album “9 Degrees West of the Moon” on January 23rd 2009. Born as a side project of the esteemed guitarist and songwriter of Labyrinth, Olaf Thorsen, to keep his working relationship with Fabio Lione (former Labyrinth vocalist who had moved on to Rhapsody) Vision Divine evolved during the years in a real band who released 5 acclaimed studio albums, one DVD and toured several times in Japan, South and North America and played in several European countries. The new album is particularly important in the history of the band as it marks the return of Fabio Lione on lead vocals, after Thorsen’s decision to say goodbye to Michele Luppi in June 2008. “Fabio’s return is like going back to square one for us”, comments the band’s creative mastermind Olaf “However Vision Divine is a band that did always move forward and I think that with his voice and interpretation he has enriched the songs and gave them a very peculiar and personal edge. I am truly enthusiast of his return in the band and look forward to bring this record out there with his amazing vocal abilities”. Vision Divine line-up is completed by Alessio Lucatti on keyboards, Cristiano Bertocchi (ex-Labyrinth) on bass, Federico Puleri on guitar and Alessandro Bissa on drums. 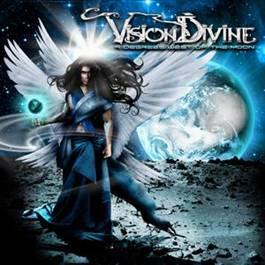 Produced by none other than the former Stratovarius mainman Timo Tolkki, Vision Divine created what is easily their most mature and intense record to date. Entitled “9 Degrees West of The Moon”, this is Vision Divine ‘s heaviest, but yet most melodic and catchy album ever, showing why they are now the number 1 band in the Italian Metal scene. “Melodies are the most important element of our music. However our songwriting is very diverse” explains Olaf, who adds “all the songs have very different atmospheres and can go from melodic songs like Violet Loneliness to very aggressive and heavy ones. I think there is something for everyone on this record”. Vision Divine are also working hard on putting up a new World Tour which will bring the band to play again in Asia, South America and possibly Europe outside their homeland Italy. “9 Degrees West Of The Moon” is a fantastic journey that fans will consider as the true Vision Divine career defining statement!